At the moment we utilize three data centers. Two in Budapest, Hungary and one in Kansas, USA. This provides our customers with the two best options for a flexible internet service. All datacenters are connected to the internet via multiple 10GE links providing redundancy and ideal traffic routing. Located at the main IX peering point our data center is connected to most of the major Tier-1 providers both locally and internationally. 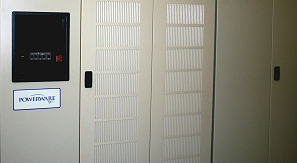 This data center is conveniently located in a refurbished office building in the III. district. It is connected with a redundant dark fiber to our BIX data center. Our Kansas City datacenter is fed by three power components critical to datacenter infrastructure. Secondary and temporary power is supplied by UPS battery systems. We have sufficient UPS battery strength to assure continuity of power to the entire dedicated server facility. In addition, a separate UPS system maintains all critical networking infrastructure. The third power comes from a 400 kilowatt diesel generator. Fuel access points on the ground level of the building allow us to refuel the generator tanks at any time. The generator can be run indefinitely to supply power to the facility. In the event of loss of utility power, the automatic transfer switch moves the power source from utility to diesel generator. The UPS systems supply temporary power during the time required for the generator to fire up. StreamTel is focused on providing highly reliable, ultra low latency network connectivity, suitable for any application. Our datacenter is fed by redundant fiber feeds from Hurricane Electric, Cogent Communications, and the Kansas City Internet Exchange (KCIX). Customers can purchase bandwidth from our BGP blended redundant pool on a per megabit basis, but are also welcome to purchase bandwidth directly from Cogent, or Hurricane Electric directly. Along with reliable power, and a solid network, security is a primary focus at Streamtel. 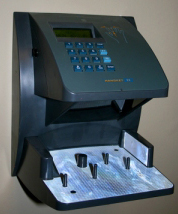 Access within the facility is controlled by biometric scanners, and monitored 24/7/365 by security cameras. Every doorway, both at the entrance of the facility and within, are secured using biometric hand scanners and monitored with video surveillance, ensuring zero unauthorized access to any part of the facility. This provides the ultimate level in protection to keep your mission critical internet services safe.